Are you feeling happy today? Are you feeling hungry? Do you get migraines? All of these behaviors, and many more, are controlled in part by the neurotransmitter serotonin. Serotonin, a small molecule made from the amino acid tryptophan, was discovered for its role in the constriction of blood vessels. Most of the serotonin in your body is found in the digestive system where it helps to control the motions needed for digestion. However, the most dramatic effects of serotonin are in the brain. Less than one in a million neurons uses serotonin for communication, but these neurons help to control our emotions, moods and thoughts. Serotonin receptor with an antimigraine drug. The membrane is shown schematically in gray. Serotonin is released from vesicles in nerve cells and picked up by receptors on the target cell surface. 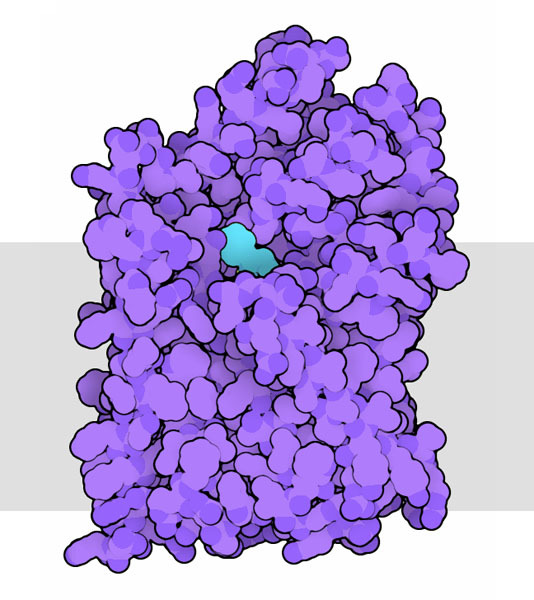 There are 15 different forms of these receptors in our bodies, most of which are G protein-coupled receptors like the one shown here from PDB entry 4iar . Serotonin binds to the portion of the receptor on the outside of the cell (shown here at the top of the picture). This induces subtle changes in the shape of the protein and sends a signal to G proteins inside the cell. In some cases, this leads to an excitatory response in the cells, and in other cases it is inhibitory, all depending on the particular receptor and its individual cellular context. Many different drugs bind to serotonin receptors and modify the normal signaling process. The structure shown here has the drug ergotamine bound in the site normally occupied by serotonin. Ergotamine activates the receptor and has been used to control the painful swelling of blood vessels that cause migraines. LSD, on the other hand, interferes with serotonin receptors involved in perception, inducing hallucinations and synesthesia. Given the central role of serotonin in the control of many emotional and physiological processes, researchers are searching for new drugs to block serotonin receptors and transporters. The challenge, however, is that the many receptors are very similar, so serotonin-blocking drugs may have deadly side effects. The appetite-suppressing drug Fen-Phen, which had to be recalled, is a perfect example: it blocks the receptor involved in appetite, but also attacks receptors involved in control of heart valves. Once serotonin has finished its signaling task, it is transported back into the nerve cell by a serotonin transporter protein. This transporter is found in the cell membrane, and transports a sodium ion and a chloride ion along with each molecule of serotonin. A similar transporter is shown here from bacterial cells, from PDB entry 3gwv . Like the serotonin receptor, the serotonin transporter is the target of many drugs used to treat depression. 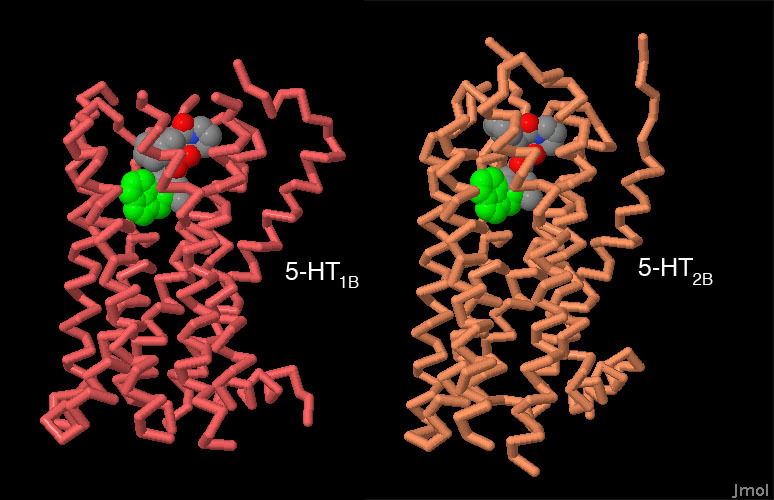 For instance, the structure shown here has fluoxetine (also known as Prozac) blocking the transport tunnel. The serotonin transporter is also one of the targets of drugs of abuse, including amphetamines such as "ecstasy". Bacterial leucine transporter with leucine. Researchers are trying to make serotonin-mimicking drugs more specific by taking advantage of the portions of serotonin receptors that are different. Two structures of different serotonin receptors with ergotamine, in PDB entries 4iar and 4ib4 , show one possible approach. 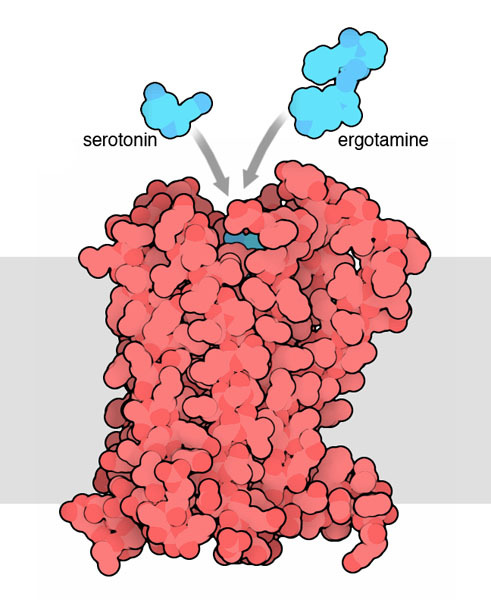 Ergotamine is much larger than serotonin, with a portion similar to serotonin (shown in green) that binds deep in the receptor pocket, and the rest binding higher in the pocket. Most of the differences between receptors are found in these more distant portions of the binding site, and may provide new opportunities for designing specific drugs. To look at these structures in more detail, click on the image for an interactive Jmol. You can see the interaction between a G protein-coupled receptor and a G protein in PDB entry 3sn6. Structures for many other G protein-coupled receptors have been solved, including opsin and adrenergic receptors. You can compare their similar structures, composed of seven alpha helices, using the Compare Structures tool. The structures of the serotonin receptor, and several other GPCRs, were determined using an engineered protein that has another small protein inserted into the protein chain. Why would this be necessary? What protein was used in the serotonin receptor structures? 4iar & 4ibr: C. Wang, Y. Jiang, J. Ma, H. Wu, D. Wacker, V. Katritch, G. W. Han, W. Liu, X. P. Huang, E. Vardy, J. D. McCorvy, X. Gao, X. E. Zhou, K. Melcher, C. Zhang, F. Bai, H. Yang, L. Yang, H. Jiang, B. L. Roth, V. Cherezov, R. C. Stevens & H. E. Xu (2013) Structural basis for molecular recognition at serotonin receptors. Science 340, 610-619. J. G. Hensler (2012) Serotonin. In "Basic Neurochemistry, 8th Edition" Elsevier. M. Berger, J. A. Gray & B. L. Roth (2009) The expanded biology of serotonin. Annual Review of Medicine 60, 355-366. 3gwv: Z. Zhou, J. Zhen, N. K. Karpowich, C. J. Law, M. E. A. Reith & D. N. Wang (2009) Antidepressant specificity of serotonin transporter suggested by three LeuT-SSRI structures. Nature Structural & Molecular Biology 16, 652-658.